Miss Elaine Robes – designed with timeless style and a comfortable fit in mind, these attractive womens robes make it hard to stop at just one. A leading lingerie and ladies sleepwear brand with a devoted multi-generational following, Miss Elaine offers an exciting range of ladies robes that are hard to resist. From long robes to short robes, solids to prints, there are endless options for every size and shape, occasion and budget. Follow along as we take a closer look at this popular sleepwear for women and share the 411 on their best styles. A soft flowing robe with a cozy comfortable fit - the Miss Elaine caftan is a great lounge wear choice when you want to slip into something relaxing. 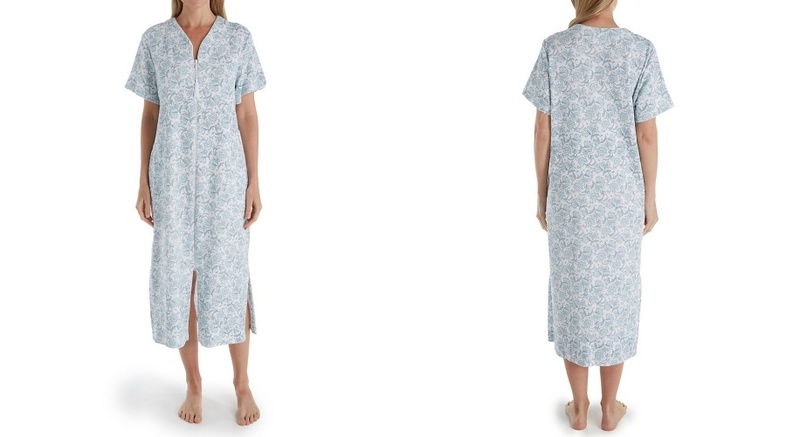 Brushed back satins and micro fleece in pretty floral prints and patterns make caftans a great choice for mixing and matching with your favorite nightgowns and pajamas. The full length cut, subtle mandarin collar, and zip front closure make a caftan a great choice for women of any height, and the silhouette is especially suited to curvy and plus sizes who want just the right combination of coverage for showing off their shape. 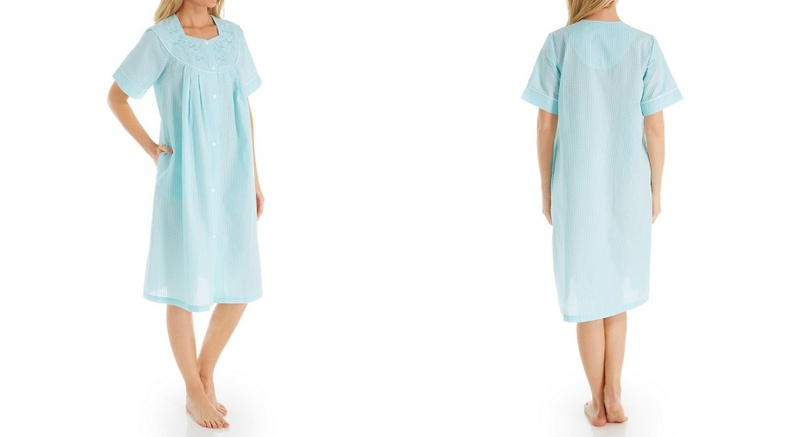 Miss Elaine nightgowns, robes and pajamas are all designed with comfort in mind. If, you prefer soft, stretchy, boxy yet feminine sleepwear, that's affordable, this lingerie brand is a great choice! 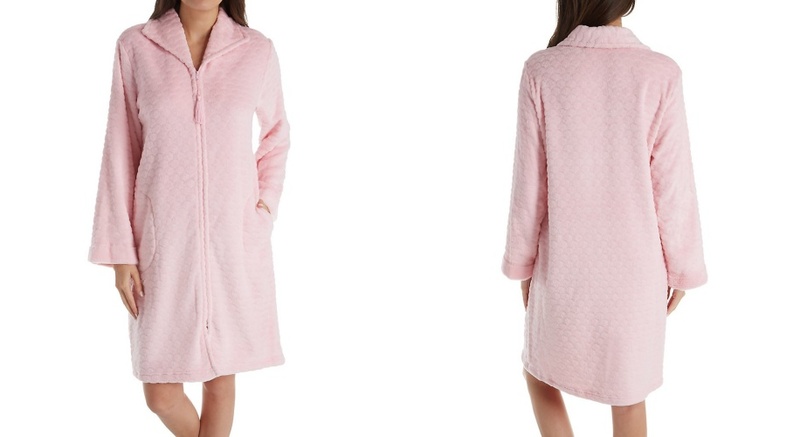 What’s not to love about the perennial favorite of ladies sleepwear - a classic cotton robe that stands the test of time with its charming styling and feminine appeal. With their exacting standards and attention to detail, Miss Elaine has mastered this best-selling intimate apparel favorite - the perfect lightweight cotton fabric in an elegant knee length with cool subtle charm. From a classic belted closure to a simple A line style with an easy relaxed fit, cotton robes are a great choice for any silhouette, from petites to plus sizes. Available in pretty florals, stripes, and prints for spring, and warm rich shades for winter, Miss Elaine robes are superb for everyday wear - a popular pick that you can enjoy for years to come. Talk about comfort! The Miss Elaine zip robe is an excellent example of combining the best of fashion with function. 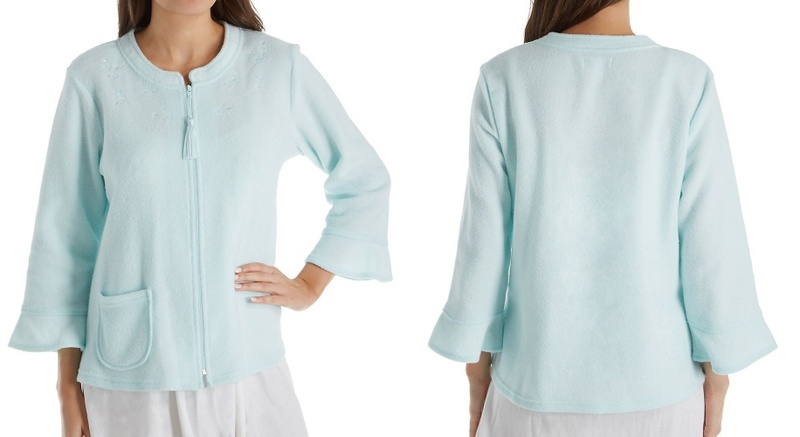 This full coverage style features a soft and flowy loose fit silhouette with an easy full zip front closure that remains closed - unlike traditional belted robes that often have a tendency to pop open at inopportune moments. Available in long robes and shorter styles, zip front robes can be worn year round, and are perfect for pairing with your favorite pajamas and nightgowns for a snuggly experience that you’ll look forward to wearing every day. When it comes to luxurious jersey that's incredibly soft, creamy dreamy, and feels amazing, Miss Elaine robes do not disappoint. This light, stretchy fabric is the perfect weight for year round wear, making it a great option for keeping you perfectly warm in the cooler months, and light enough to wear over your favorite summer pajamas. Jersey is also the perfect travel companion that tucks neatly into your suitcase. Short robes and just below the knee length offer the right amount of coverage that works well for every occasion. One of the best styles for keeping warm and cozy, fleece robes are a popular choice for the colder fall and winter months, and for binge watching your favorite shows on Netflix. From popular long zip front robes to traditional belted wraps, fleece bath robes for women flatter every shape in pretty and relaxed styles. An easy wear and care favorite, these plush robes are perfect for petites who want to show off their legs and add definition to the waist, and fuller figures who enjoy the flexibility of a traditional style robe that allows for a larger bust.